How to Use Which and That Correctly? 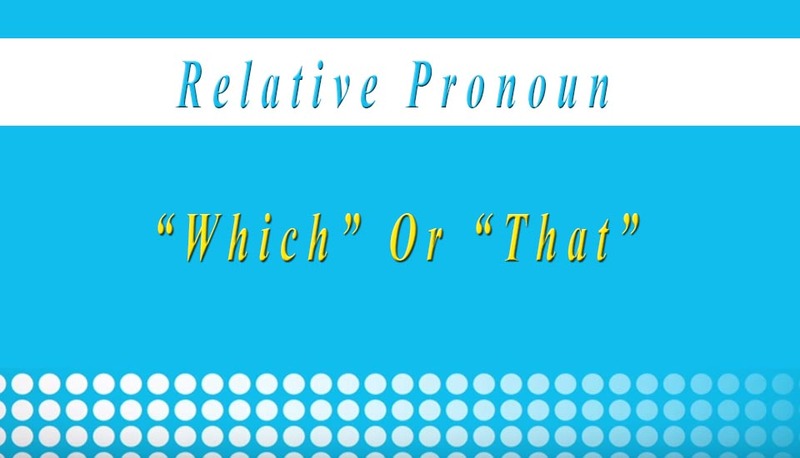 How to Use “Which” and “That” Correctly? • The car, which is parked outside, is my brother’s. • The car that was parked outside is more expansive than this one. Now, in the first sentence, the clause ”which is parked outside” gives us some information about the car, but it isn’t essential to the meaning of the sentence, we know the significant fact, that “the car is my brother’s” whether or not we have the additional information contained in the clause “which is parked outside.” This clause is, we can say, nonessential, or, as the grammarians put it, a nonrestrictive clause, because it gives extra information about the principal clause. We indicate its “expendable” nature by using the pronoun “which” and, in writing, by setting off the clause with commas. In the second sentence, on the other hand, the clause beginning with “that” is clearly essential to the meaning of the sentence. Which would otherwise only tell us that one (unspecified) car is more expansive than another (unspecified) car. They are signaled by the pronoun “that,” and, in writing, they are not set off by commas. As you can see, the rules can be pretty clearly stated: Use “which” in a nonrestrictive clause (a clause not essential to the meaning of the sentence). Use that in a restrictive clause (a clause essential to the meaning of the sentence). • The man whom you just met is my brother-in-law. Here’s Why: In this case “that” is correct, because the clauses are restrictive: They help us distinguish one group of structures from another group. I hope the rules mentioned above about: “How to Use “Which” and “That” Correctly?” prove beneficial for your speaking and writing accuracy. You need to do is use it correctly so no.